A student is using Tilt Brush to make a three-dimensional drawing. Through the larger display at the back, other students can share the player’s view. Ewha VR Room opened last September, under the supervision of the Department of Computer Science and Engineering. The room is located in a separate area inside Smart Software Lab (Room 121) at Asan Engineering Building, where students are free to do anything from playing Virtual Reality (VR) games to designing artworks in 3D. Ewha Voice visited Room 121 to take a closer look at the school’s first virtual reality setup. Oculus Rift: The first thing you can see when entering the VR Room is the Oculus Rift. The Oculus Rift is a virtual reality headset, and the school provides nine VR games and programs that students can run on both Oculus Rift and HTC VIVE. The device was opened to students at last year’s LUCETE festival, where the school held a VR workshop for students from the College of Liberal Arts. HTC VIVE Pro: Situated in the left side of the VR Room, beginners who are new to VR are recommended to start with VIVE. 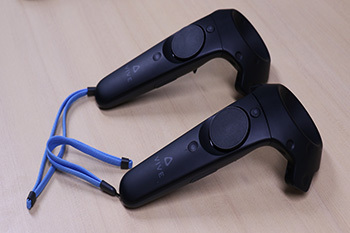 The device is compatible with various Steam VR games such as Job Simulator, LyraVR, The Climb, and Subnautica. Students can also use Tilt Brush for 3D drawing and design. Cyberith Virtualizer: Paired with the Oculus Rift, the Virtualizer is capable of VR locomotion, which means the player can move within the virtual reality environment according to his or her actual movements. As there are more precautions for using the Virtualizer, students who wish to use this device needs to contact the department office and will be assisted by a technician. 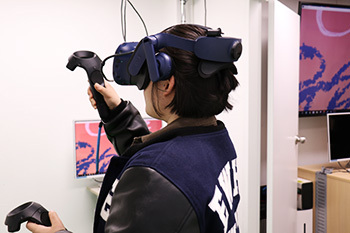 To use the Ewha VR Room, students from the Division of Software Science and Engineering can register by simply typing their names on the Google Sheet found in each department’s website. For students outside of the division, contacting the department office or the corresponding technician at (02) 3277-3893 is necessary.